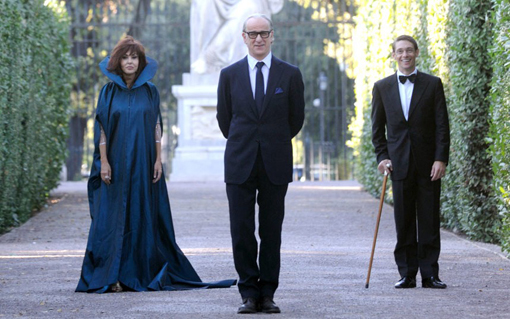 Paolo Sorrentino’s updated “La Dolce Vita” has neither story nor direction by the great Fellini, nor the gravitas and bodies of Mastroianni or Ekberg. But it has everything else. The people are twice as beautiful, the costumes are twice as unabashedly rich, the music is twice as outrageous and the cast of the film can dance. All one thousand of them (at least it seems like a thousand) can dance. 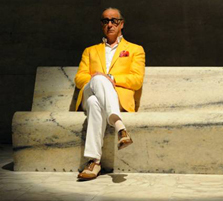 Maybe there are not one thousand dancers in the film, but Sorrentino’s gifted direction makes it seem like a thousand. Maybe, as narrator Jep Gambardella says, it only seems like a thousand dancers because the dancers’ trains are the best in Rome. Why are they the best in Rome? “Because they go nowhere,” says the philosophical Gambardella, laying yet another of his soliloquies on the, hopefully cooperative, audience. Gambardella is played by archetypal pop Roman Toni Servillo (2009 Golden Globe for Best Actor for “Gomorra”). Like Mastroianni in “Dolce Vita,” Jeb is a professional writer, a man so trained in observing the details around him that he cannot turn off his observation when he wants to. When he is alone, the music has died down, and the dancers have gone home he directs his questioning inward to his own soul. At these times, he invites the audience to join him in trying to explain why people do the things he does. The audience responds, “Because, Jeb, those things are an awful lot of fun.” Besides, when you do them on screen you never get sick, hung over, or suicidal, catch a sexual disease or are thrown in jail. So that makes it really fun. Plus you get to hang out with glamorous height-weight proportionate people and dance to great music on rooftops in the middle of the most beautiful and romantic city in the world. Italy’s official entry to the 2013 Academy Awards, this flick teeters well into the too-good-to-be-true. It provides a proper amount of self-examination mixed in with a dozen reasons why every person in the audience should take their next vacation in Rome. Neo-realism’s wages of sin are not a big part of the scene. Even when Jeb admits his life is going nowhere we still get the feeling that he thinks his life is going pretty well. He is a successful journalist, a good writer and he has an editor and a public who constantly support and validate him. Everybody seems to have a permanent motivation to urge him to do more, and be more, of what he can do and be. Praise, great clothes and a life in a never-never land where nobody has to confront reality, unless they wish to. What’s not to like? Then, one day, a not-so-funny thing happens to Jeb. He turns 65 and his world falls apart. He wants to write the next great novel, a work that actually means something instead of simply entertaining, as was the case with his first novel. OK, there should be some middle ground here. Such as writing a couple novels to ensure a lifetime of wealth and then hunkering down over the masterpiece. Impossible for Jeb, and impossible for the film, for that would not make a very interesting movie at all. Instead, there are parties and social criticism of every stripe until, at least for the last thirty to forty minutes of the 142-minute movie, we have just about had enough. Stop the film, let us call our travel agent today so the Roman fun can begin. Enough of this movie. Luca Bigazzi’s cinematography is a huge part of this film. He is able to go from the minute, the cracking and flaking paint on the ancient walls, to the distance shot of the lighted rooftop with the scene of matchless revelry. But there is something a little too pat about all this. Perhaps there is simply not enough ugliness. Even the ugly seems to be beautiful, just as the worst parts of Jeb’s life are still pretty good. A score of choral works by David Lang (I Lie), Vladimir Martynov (The Beatitudes), John Tavener (The Lamb) and Arvo Part (My Heart is in the Highlands) are alternated with the brainless pop music of the parties and give weight to the inexplicable absurdity of Rome and cities everywhere. Concentrations of population where humanity has reached critical mass and is no longer responsible to the rules that govern the outside world.